Continuous processing as outlined by the regulatory agencies is the area of focus of the pharmaceutical industry to improve product quality and productivity. However, establishing the correlation between the processing parameters and the product features is crucial to optimize continuous processing, and get the approval of regulatory agencies. Nonetheless, it is a challenging task as most conventional techniques are inefficient for powder and granule analysis. This article discusses the application of Freeman Technology’s FT4 Powder Rheometer® and GEA’s ConsiGmaTM continuous high shear wet granulation and drying system to establish the link between granule properties and changes in processing parameters and formulation in a continuous processing environment. As part of the study, tablet manufacture was also studied to identify the relationship between granule properties and key quality parameters of the tablets to obtain the data required for true Quality by Design (QbD). Freeman Technology’s FT4 Powder Rheometer® (Figure 1) provides automated quantification of bulk material characteristics. These reliable and extensive data are useful in the determination of the impact of process and product development. 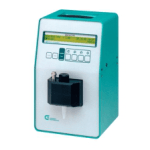 Numerous bulk material characteristics can be measured using the universal powder tester. Besides measuring flow properties, the rheometer also features a shear cell and is capable of quantifying bulk properties such as permeability, compressibility, and density. The ConsiGma-1 (Figure 2) is the laboratory-scale variant of the ConsiGma concept, comprising a patented continuous high shear granulator with a tiny dryer that can handle samples of several kilograms down to a few hundred grams. The instrument can perform continuous production of granules without substantial startup and shutdown waste. Its integrated controls facilitate producing granules with a variety of characteristics. The FT4 Powder Rheometer has become an essential tool to investigate the flow and caking behavior of our products. To analyze the granule properties, a series of experiments was performed on two simple powder formulations of dicalcium phosphate (DCP) and paracetamol (APAP) by varying water content, granulator screw speed, input powder feed rate. The response of different materials to variation in processing parameters of the ConsiGma-1 is show in Figures 3 and 4. Higher Basic Flowability Energy (BFE) is the result of a lower screw speed (Figure 3). BFE is the measure of the dynamic flow behavior of a wet mass or powder under analysis. Figure 3. The data gathered from the APAP formulation shows increasing water content, which results in higher BFE for all screw speeds (for a fixed input feed rate of the powder). Larger, denser, and more adhesive granules are the result of lower screw speeds and higher water content, showing more resistance to forced flow. Moreover, BFE increases linearly corresponding to water content, but not to screw speed. In Figure 4, a significant reduction in the BFE can be observed with increasing powder feed rate. From the additional data, granules with same properties can be produced at higher water contents by increasing the feed rate. Figure 4. Results collected from the DCP formulation. Based on these data collected from two dissimilar substrates, it is possible to produce granules with specific properties by applying different combinations of feed rate, screw speed, and water content (Table 1). Conditions 1 and 2 had BFE values around 2200mJ while assessing the wet mass, whereas the BFE of Conditions 3 and 4 produced values around 3200mJ. During the progression of the granules in the production process, the corresponding BFE values remain constantly grouped. The BFE values for Conditions 3 and 4 are higher than that for Conditions 1 and 2 (Figure 5). Figure 5. BFE values for Conditions 1, 2, 3, and 4 (photos courtesy of GEA Pharma Systems). The results reveal that manufacturing conditions influence granule properties and there are different manufacturing routes available to generate the desired granule quality. These findings are crucial for the formulation scientist, equipment designer, and process engineer as it provides more options to develop formulation / unit operation combinations to manufacture products with a desired quality. However, establishing the correlation between the granule characteristics and the final product (tablet form) characteristics is even more meaningful. For this purpose, the four batches of the granules (wet, dried, milled, and lubricated) were pressed into tablet form using a GEA ModulTM S rotary tablet press (Figure 6). 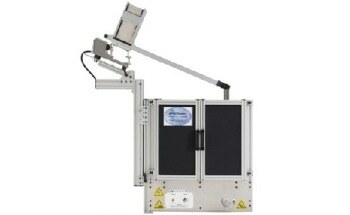 A Dr. Schleuniger Pharmatron 8M tablet hardness tester was used to measure the strength of the resultant tablets. Figure 6. GEA ModulTM S rotary tablet press (photos courtesy of GEA Pharma Systems). For the dried and milled granules, the correlation between the BFE and tablet hardness is extremely strong with an R2 value > 0.99 (Figure 7). For the lubricated granules and wet mass, the correlation is slightly inferior due to the presence of lubricant and water, which significantly affect the bulk flow properties irrespective of their low concentrations. Figure 7. The correlation is extremely strong between tablet hardness and the BFE for the dried and milled granules with an R2 value of greater than 0.99. The quantification results of BFE confirm that there is a direct correlation between the bulk flow properties of the granules. These data are also helpful in the development of scaling measures for batch granulation processes. Once a specific BFE has been determined as giving the optimal critical attribute for the final tablet, focusing specific instrument types or operational conditions becomes no longer required. It is possible to ensure the tablet quality as long as the wet granule achieves the desired BFE value. The study findings reveal the possibility of generating tablets with specific properties utilizing various combinations of process parameters. This is a crucial step en route for a full Design Space specification. Future work will validate the relationship between the granule characteristics and other CQAs of the final tablet, including dissolution, weight variation, and content uniformity. This information has been sourced, reviewed and adapted from materials provided by Freeman Technology. For more information on this source, please visit Freeman Technology.